Today was Nelson Mandela’s 95th birthday. All over the world, people of all races celebrated together to mark the life and work of this great man. Toronto was no exception. Despite the scorching heat wave, I joined an enthusiastic group of kids, athletes, award-winning artists and members of the public to sing songs and commemorate this important day. 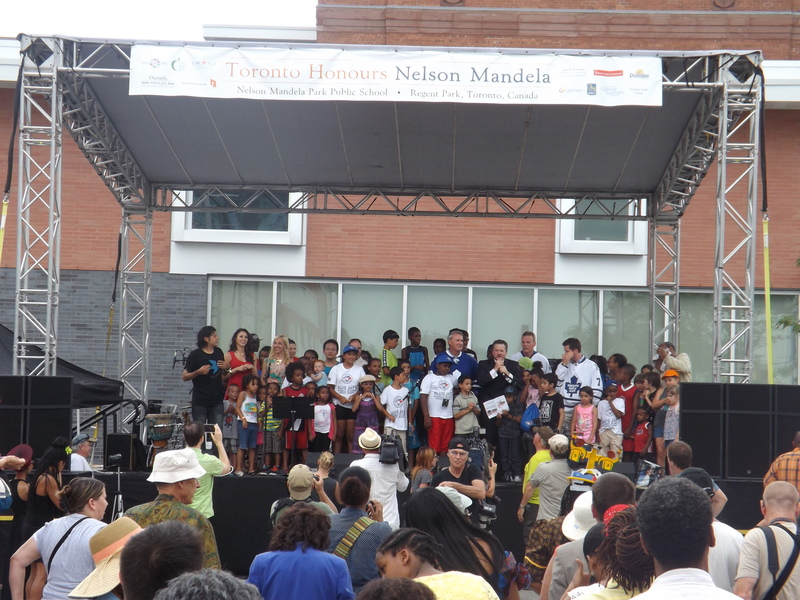 The venue was the Nelson Mandela Park Public School, renamed in 2001 and located downtown in Regent Park. The most moving part of the event for me was when the children on stage were led through 67 seconds of applause to commemorate the 67 years that he devoted to fighting for democracy and liberating South Africa. He truly made the world a better place for all of us. Nelson Mandela’s life has been an inspiration for millions across the globe. To me, his life is the greatest example of victory again all odds. Nothing is impossible in this world, as long as I continue to have faith, believe in myself, and never extinguish hope. The light at the end of the tunnel may fade at times, but it will never die.